John Stevenson in front of an Oregon Army National Guard UH-72A Lakota Helicopter. 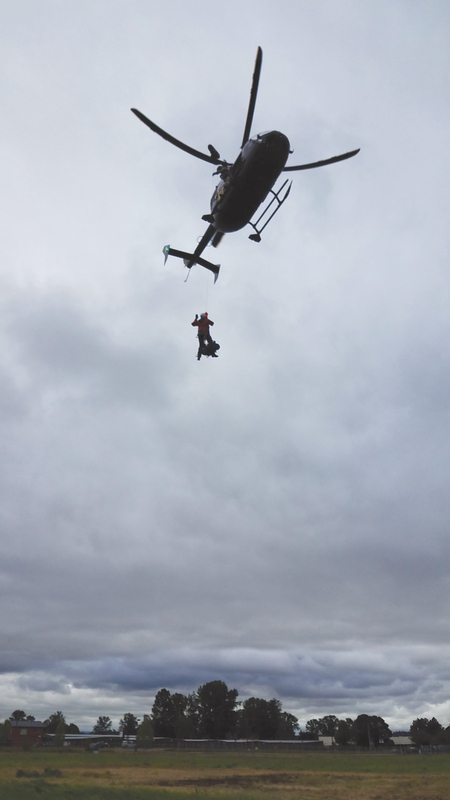 Practicing for rescue operations, CMRU member Todd Shechter is lowered to the ground by the crew of a hovering Oregon Army National Guard Lakota helicopter. “He might have survived, or he might have succumbed to exhaustion, dehydration, or hypothermia,” said Todd Shechter (’99 B.S., Management Information Systems), a member of the all-volunteer Corvallis Mountain Rescue Unit (CMRU). Not every CMRU mission has a happy ending, and at the start of each one — a dozen or more a year — that nagging question hangs in the air: Is this going to be a rescue or a body recovery? From 6:30 a.m. on Sept. 9, 2017, three men from CMRU had bushwhacked and rappelled through steep terrain near Natural Phantom Bridge, a 60-foot rock arch eight miles northwest of Detroit, Oregon. They were looking for a 40-year-old man who’d headed out on an overnight camping trip with a day’s supply of food. He should have returned two days earlier. The searchers came up empty, as did teams dispatched by the Marion County Sheriff’s Office and a pair of Oregon Air National Guard helicopters. When an empty campsite was found a few miles north of CMRU’s position, the command center, located 25 miles to the northwest, asked them to check it out. They found worrisome signs: the man’s tent, food, and sleeping bag. They suspected he had moved even farther north, away from the nearest road, and they wanted to give chase. Instead, the incident commander instructed them to retreat south and prepare to start fresh in the morning. But they had other ideas. That did the trick. The team ascended through thick vine maple and crested a ridgeline a couple of hours later. By then, late afternoon, they were resigned that they wouldn’t find their target that day. “That’s a bad feeling,” Shechter said. Then, everyone stopped in their tracks. From the ridge, Shechter relayed compass bearings to one of the helicopters, directing it toward the source of the sound. Twice it circled in; twice it withdrew, contending with a tree canopy so thick that the team couldn’t see the aircraft when it was nearly overhead. So CMRU started down the slope, alternately calling the victim’s name and stopping to listen for a response. Not 10 minutes later, at 5:30 p.m., they found him lying on the ground a few hundred feet below the ridge. He was exhausted, hungry, and dehydrated, but uninjured. They filled him with hot food, warm Gatorade, and reassuring words, and then put him in dry clothes. Several hours later, they all strapped on headlamps and walked the man out, slowly, in darkness, three miles to the road. It’s great when luck bends your way, but it’s not luck that rouses three people from warm beds, two hours before dawn, on a Saturday to help someone in desperate need. For Shechter, who is from Fairbanks, Alaska, rescuing people runs in the family. His father was a fire chief and his brother is a paramedic. In 2005, he joined CMRU, a tight-knit band of about 25 men and women. After every mission, the team reviews its performance and lessons learned — what they did, what they saw, and what could be fixed. If it was a body recovery, an entirely different emotional support component plays in.